Stone mosaic on the grid is the original idea for the interior and the garden as well. Pebbles, broken stone mosaic or cut stone is the perfect material for almost any space. 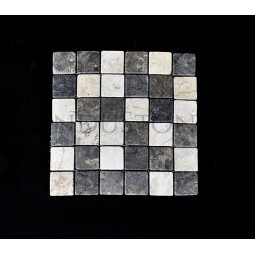 We would like to introduce a wide range of our stone mosaics to you. The uniqness of our stone washbasins will add charm to any bathroom. Each one is urepatable, hand-made by Indonesian craftsmen from a single block of natural stone. We invite you to familiarize yourself with a wide selection of stone and wooden products . InduStone’s offer also includes stone pedestals, urinals , garden lamps, bathroom accessories . Wooden furniture made from exotic wood are novelity in our shop. Please, have a look!